A new range of Elite Implants are now lootable in the Wastelands. 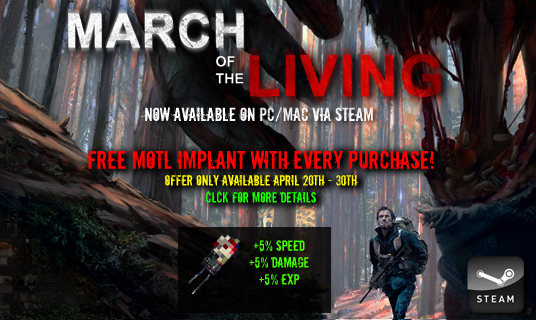 March of the Living Now Available on Steam - Claim your free implant! March of the Living is now available on Steam for PC/Mac! We are offering a free gift for all Dead Frontier players who decide to buy March of the Living before April 30th. The MOTL Implant grants +5% Speed, +5% Damage and +5% EXP. March of the Living is new zombie survival strategy game being published Creaky Corpse Ltd (but developed by Machine22). We're happy to announce that the game will be released for PC/Mac via Steam on April 20th, for a price of $13.49. We're also offering a free gift for all Dead Frontier players who decide to buy March of the Living in the first 10 days of release. 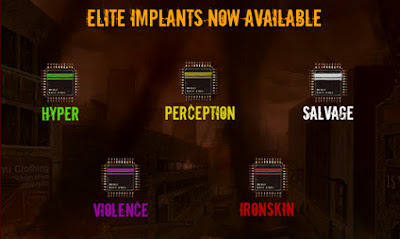 The MOTL Implant grants +5% Speed, +5% Damage and +5% EXP. If you're interested, simply add MoTL to your Steam wishlist and purchase between 20th-30th April. Then log into the Dead Frontier site, and check the announcements boards for details on how to claim your free gift. We will only grant one MOTL Implant per Dead Frontier account. In addition if you buy multiple copies via the same Steam account, we unfortunately will not be able to give you multiple implants. The game must also be activated by you (not simply kept in your Steam inventory). This year we'll be celebrating Easter with maximum carnage. The Easter Evisceration event stats on Friday the 25th of March (Easter Friday) and continues until the early hours of Tuesday March 29th. Make them bleed their own blood this Easter! Luckily we managed to find three great event designers from the Dead Frontier community (Lys, Clayton and Roxas13) and the game is now getting close to completion. I'm just writing to let you know that the maximum level possible in Dead Frontier has just been raised to 325. For every level after 220 you will receive 1 proficiency point. In addition once you hit level 325 you'll get lifelong access to the new X-Dusk gear and 4 extra implant slots, making a total of 16. Stay tuned for news of more Dead Frontier updates coming soon!